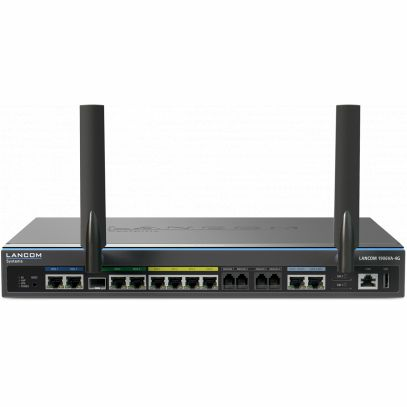 The LANCOM 1906VA-4G is the first choice for combining two All-IP / VDSL connections. This enormously powerful business VPN router supports load balancing across multiple parallel Internet connections, for example up to 2x 100 Mbps via VDSL Vectoring and 300 Mbps with LTE Advanced. It also supports the use of high-speed fiber-optic Internet connections. The integrated ISDN and analog interfaces allow your existing telephony equipment to integrate seamlessly into the All-IP network. With the award-winning LANCOM IPSec VPN, 25 (optionally 50) sites and mobile employees benefit from Secure. Networks.